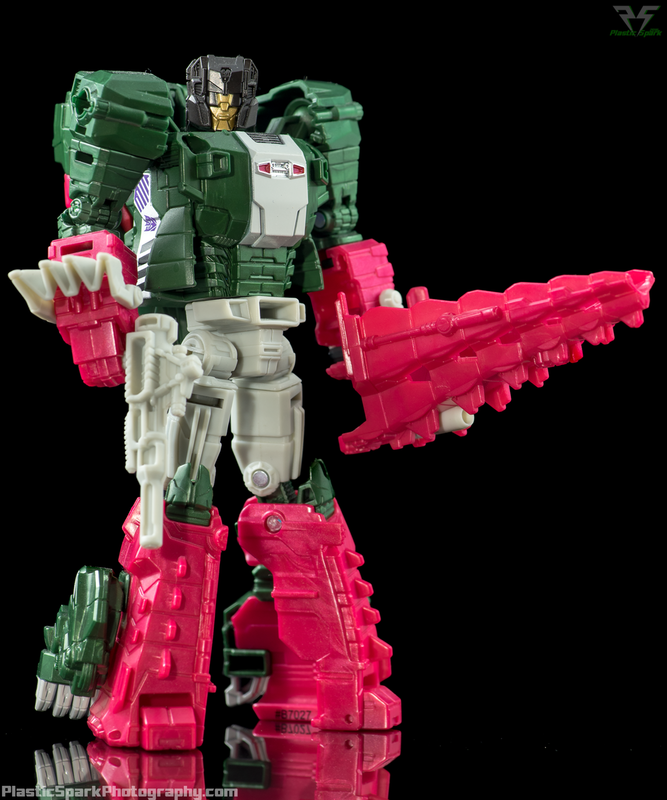 Decepticon Headmaster turned Comedian Skullcruncher has made his way to the deluxe line up for Titans Return. 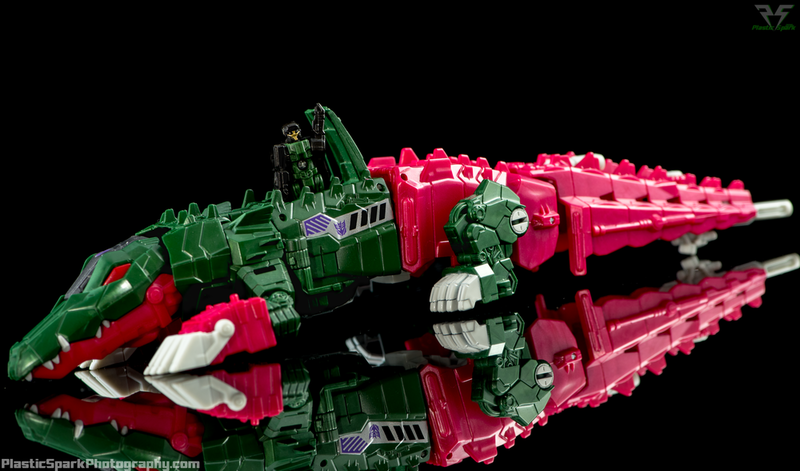 Skullcruncher (Skullsmasher) looks amazing but he seems to be plagued with QC issues across the board. His hip ball joints and mushroom pegs are incredibly loose and can cause issues while posing. This can be fixed with some nail polish or floor polish so it's not the end of the world but it is frustrating that you should have to fix a brand new figure out of the box. User reports seem to indicate that the Takara version shares this issue as well. For the first Decepticon Headmaster to have these kind of issues is a bummer but luckily it doesn't seem to be an issue with any of the other deluxe molds. My only other critique is the implementation of his Tail as a weapon. It really doesn't look the part for a gun and I prefer it to be a sword like the original figure. I added a post from one of my Nonnef hands to allow him to hold it upright but this is not a piece that most people will just have lying around. 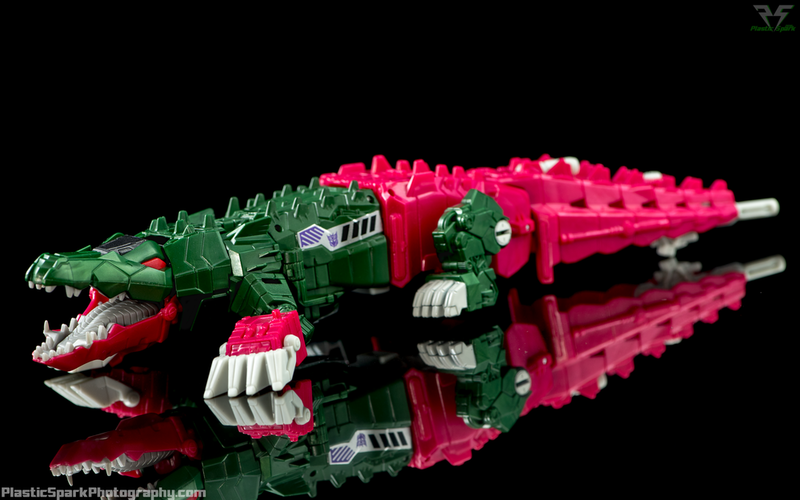 Skullcruncher's crocodile mode is simply fantastic. I did not expect as much articulation as they managed to pack in. A ball joint at the base of the head and jaw hinge allow for some incredible emoting. The cockpit flap is a soft rubber piece which seems to rub a few people the wrong way but honestly I don't think it causes any issues one way or the other. With a little TLC Skullcruncher is what I would describe as adequate. He doesn't really do anything extraordinary but he looks awesome and his articulation is on par with any other deluxe in the line. Definitely a worthwhile pickup if you want a full set of original Headmasters.